2017 Colorado Case – Proves Once Again – Never Talk To The Police! – While I have written articles on interacting with the police many times, it bears repeating that the most dangerous thing you can do is talk to law enforcement. Understanding your rights in this complex area is important. Recently a new Colorado case, which reversed a lower Courts suppression of alleged illegally seized evidence, once again is instructive on a person should NEVER – EVER casually converse and cooperate with a police investigation. The Fourth Amendment to the United States Constitution protects persons against unreasonable searches and seizures. U.S. Const. amends. IV, XIV. A violation of the Fourth Amendment – in connection with contacting the person on the street – will most often turn on facts that demonstrate that the police officer, by means of physical force or show of authority, has restrained your liberty to the point that a Court would consider the contact a ‘seizure’ of your person or your effects. When there is a ‘seizure’ of your person – clearly defined Constitutional protections are triggered and law enforcement is required to justify that seizure through evidence establishing probable cause if the seizure is an arrest – or by a evidence establishing reasonable articulable suspicion of criminal activity if the seizure is an investigatory stop. ….when the police use “non-coercive tactics” to elicit the cooperation of a citizen, the encounter is consensual so long as a reasonable person in that citizen’s position would feel free to leave. The Key Test Was Your Encounter With The Police “Consensual” Or Unconstitutional? Colorado courts apply a “totality of the circumstances” test to determine whether the police exercised force or authority to effect a stop, or whether the police merely sought the voluntary cooperation of a citizen through a consensual encounter. There are fundamentally three ways to have contact with the police. First: the police have enough evidence (requires probable cause) to arrest you. . An arrest occurs when an police officer physically restrains you or otherwise uses his authority to make it clear that you are not free to leave because you will be detained. Second: the police have enough evidence to conduct an investigatory stop (requires reasonable suspicion). Investigatory stops occur where a police officer stops you to investigate whether or not you committed a crime and has at least a reasonable and articulable suspicion you may have committed a crime. Third: the police have no evidence that a crime has been committed and rely on your ignorance of the law to develop this evidence during a “consensual encounter” during which they ask – and you answer – their questions. The casual nature of a consensual encounter with the police often leads to the target of the investigation – you – dropping your guard. While the contact may seem “minimal” and may even seem harmless, the goal of the police isto develop probable cause or reasonable suspicion of a crime. A Court must find, under the totality of the circumstances, that a reasonable person in your position felt they had the right to leave at any time and the right to refuse any questions posed by the officers. Remember- to conduct a consensual encounter, the police do not need probable cause or reasonable suspicion that crime is afoot to initiate contact, they just need your cooperation. In theory, walking away from a cop who is questioning you is difficult – and the police know it. People do not understand that they can leave any time they wish when a police officer (or several police officers) casually approach them and begin asking questions. The police know that if they make a mistake and conduct an investigatory stop without reasonable suspicion, any incriminating evidence they seize will be thrown out of court. Therefore they will go to a kind of “plan b” and claim that the interaction was a casual and therefore consensual encounter. Courts are called upon to decide whether an encounter with the police is casual or compelling. They do this by reviewing the behavior of the police in the given fact pattern. 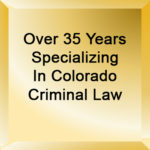 Colorado, unlike many other states, actually requires, as a matter of law, that police officers give individuals seeking to conduct a search of a person or a vehicle an oral advisement of their Fourth Amendment rights. (1)(a) Prior to conducting a consensual search of a person who is not under arrest, the person’s effects, or a vehicle, a peace officer shall comply with paragraph (b) of this subsection (1). The 2017 Case of People v. Shoen: Why You Should Never Cooperate With A Police Investigation – Fourth Amendment – Consensual Encounters. In the Shoen case, the Colorado Supreme Court held, (when they came upon Shoen near some recently burgled storage units), that the police officers’ encounter with Shoen was consensual. Shoen admitted to having methamphetamine in his truck. Before the officers contacted Shoen, they parked their patrol car several storage units behind Shoen’s truck. They did not use the police car’s emergency lights or siren, and they left the exit paths in the storage complex open. They explained why they were there and used a conversational tone throughout the encounter. Neither of the officers touched Shoen nor directed him where to stand or sit. The officers did not display any weapons or threaten Shoen at any point in their conversation. Shoen agreed to talk to them. The officers never instructed Shoen to remain in the area or restrained him. They told him that he should call someone to come and pick him up so he could leave. They asked Shoen’s permission to search the bed of his truck and told him that he did not have to let them look. The officers did not attempt to intimidate Shoen into remaining at the storage unit – they recommended that he call someone to pick him up so he could leave. According to the decision, Shoen’s encounter with the police was consensual “because the defendant’s liberty was not restrained and his voluntary cooperation was elicited through non-coercive questioning.” Therefore under “the totality of the circumstances,“ a reasonable person in Shoen’s position would have known that he was free to leave or decline the officers’ requests. My recommendation – find “the stomach” when you have an encounter with the police – to ensure it is NOT consensual. Make it clear to the police that you want a lawyer (lawyer up) and that you are NOT COMFORTABLE with the contact and will not answer their questions. H. Michael works hard to get his clients the best possible results in and out of the courtroom. He has written, and continues to write, extensively on Colorado criminal law and he hopes this article helps you in some small way – 2017 Colorado Case – Proves Once Again – Never Talk To The Police! 2017 Colorado Case - Proves Once Again - Never Talk To The Police! While I have written articles on interacting with the police many times, it bears repeating that the most dangerous thing you can do is talk to law enforcement. Understanding your rights in this complex area is important.